Nonsteroidal anti-inflammatory drugs (NSAIDs) are a drug class that reduce pain, decrease fever, prevent blood clots and, in higher doses, decrease inflammation. Side effects depend on the specific drug, but largely include an increased risk of gastrointestinal ulcers and bleeds, heart attack and kidney disease. The term nonsteroidal distinguishes these drugs from steroids, which while having a similar eicosanoid-depressing, anti-inflammatory action, have a broad range of other effects. First used in 1960, the term served to distance these medications from steroids, which where particularly stigmatised at the time due to the connotations with anabolic steroid abuse. NSAIDs work by inhibiting the activity of cyclooxygenase enzymes (COX-1 and/or COX-2). In cells, these enzymes are involved in the synthesis of key biological mediators, namely prostaglandins which are involved in inflammation, and thromboxanes which are involved in blood clotting. There are two types of NSAID available: non-selective and COX-2 selective. Most NSAIDs are non-selective, and inhibit the activity of both COX-1 and COX-2. These NSAIDs, while reducing inflammation, also inhibit platelet aggregation (especially aspirin) and increase the risk of gastrointestinal ulcers/bleeds. COX-2 selective inhibitors have less gastrointestinal side effects, but promote thrombosis and substantially increase the risk of heart attack. As a result, COX-2 selective inhibitors are generally contraindicated due to the high risk of undiagnosed vascular disease. These differential effects are due to the different roles and tissue localisations of each COX isoenzyme. By inhibiting physiological COX activity, all NSAIDs increase the risk of kidney disease and, through a related mechanism, heart attack. The most prominent NSAIDs are aspirin, ibuprofen and naproxen, all available over the counter in most countries. Paracetamol (acetaminophen) is generally not considered an NSAID because it has only minor anti-inflammatory activity. It treats pain mainly by blocking COX-2 mostly in the central nervous system, but not much in the rest of the body. NSAIDs are usually used for the treatment of acute or chronic conditions where pain and inflammation are present. Aspirin, the only NSAID able to irreversibly inhibit COX-1, is also indicated for antithrombosis through inhibition of platelet aggregation. This is useful for the management of arterial thrombosis and prevention of adverse cardiovascular events like heart attacks. Aspirin inhibits platelet aggregation by inhibiting the action of thromboxane A2. In a more specific application, the reduction in prostaglandins is used to close a patent ductus arteriosus in neonates if it has not done so physiologically after 24 hours. NSAIDs are useful in the management of post-operative dental pain following invasive dental procedures such as dental extraction. When not contra-indicated they are favoured over the use of paracetamol alone due to the anti-inflammatory effect they provide. When used in combination with paracetamol the analgesic effect has been proven to be improved. There is weak evidence suggesting that taking pre-operative analgesia can reduce the length of post operative pain associated with placing orthodontic spacers under local anaesthetic. Combination of NSAIDs with pregabalin as preemptive analgesia has shown promising results for decreasing post operative pain intensity. The effectiveness of NSAID's for treating non-cancer chronic pain and cancer-related pain in children and adolescents is not clear. There have not been sufficient numbers of high-quality randomized controlled trials conducted. The widespread use of NSAIDs has meant that the adverse effects of these drugs have become increasingly common. Use of NSAIDs increases risk of a range of gastrointestinal (GI) problems, kidney disease and adverse cardiovascular events. As commonly used for post-operative pain, there is evidence of increased risk of kidney complications. Their use following gastrointestinal surgery remains controversial, given mixed evidence of increased risk of leakage from any bowel anastomosis created. An estimated 10–20% of NSAID patients experience dyspepsia. In the 1990s high doses of prescription NSAIDs were associated with serious upper gastrointestinal adverse events, including bleeding. Over the past decade,[when?] deaths associated with gastric bleeding have declined. If a COX-2 inhibitor is taken, a traditional NSAID (prescription or over-the-counter) should not be taken at the same time. In addition, people on daily aspirin therapy (e.g., for reducing cardiovascular risk) must be careful if they also use other NSAIDs, as these may inhibit the cardioprotective effects of aspirin. Rofecoxib (Vioxx) was shown to produce significantly fewer gastrointestinal adverse drug reactions (ADRs) compared with naproxen. This study, the VIGOR trial, raised the issue of the cardiovascular safety of the coxibs. A statistically significant increase in the incidence of myocardial infarctions was observed in patients on rofecoxib. Further data, from the APPROVe trial, showed a statistically significant relative risk of cardiovascular events of 1.97 versus placebo—which caused a worldwide withdrawal of rofecoxib in October 2004. Use of methotrexate together with NSAIDS in rheumatoid arthritis is safe, if adequate monitoring is done. NSAIDs, aside from aspirin, increase the risk of myocardial infarction and stroke. This occurs at least within a week of use. They are not recommended in those who have had a previous heart attack as they increase the risk of death or recurrent MI. Evidence indicates that naproxen may be the least harmful out of these. NSAIDs aside from (low-dose) aspirin are associated with a doubled risk of heart failure in people without a history of cardiac disease. In people with such a history, use of NSAIDs (aside from low-dose aspirin) was associated with a more than 10-fold increase in heart failure. If this link is proven causal, researchers estimate that NSAIDs would be responsible for up to 20 percent of hospital admissions for congestive heart failure. In people with heart failure, NSAIDs increase mortality risk (hazard ratio) by approximately 1.2–1.3 for naproxen and ibuprofen, 1.7 for rofecoxib and celecoxib, and 2.1 for diclofenac. A 2005 Finnish study linked long term (over 3 months) use of NSAIDs with an increased risk of erectile dysfunction. This study was correlational only, and depended solely on self-reports (questionnaires). A 2011 publication in The Journal of Urology received widespread publicity. According to this study, men who used NSAIDs regularly were at significantly increased risk of erectile dysfunction. A link between NSAID use and erectile dysfunction still existed after controlling for several conditions. However, the study was observational and not controlled, with low original participation rate, potential participation bias, and other uncontrolled factors. The authors warned against drawing any conclusion regarding cause. The main adverse drug reactions (ADRs) associated with NSAID use relate to direct and indirect irritation of the gastrointestinal (GI) tract. NSAIDs cause a dual assault on the GI tract: the acidic molecules directly irritate the gastric mucosa, and inhibition of COX-1 and COX-2 reduces the levels of protective prostaglandins. Inhibition of prostaglandin synthesis in the GI tract causes increased gastric acid secretion, diminished bicarbonate secretion, diminished mucus secretion and diminished trophic[clarification needed] effects on the epithelial mucosa. Clinical NSAID ulcers are related to the systemic effects of NSAID administration. Such damage occurs irrespective of the route of administration of the NSAID (e.g., oral, rectal, or parenteral) and can occur even in people who have achlorhydria. Ulceration risk increases with therapy duration, and with higher doses. To minimize GI side effects, it is prudent to use the lowest effective dose for the shortest period of time—a practice that studies show is often not followed. Over 50% of patients who take NSAIDs have sustained some mucosal damage to their small intestine. The risk and rate of gastric adverse effects is different depending on the type of NSAID medication a person is taking. Indomethacin, ketoprofen and piroxicam use appear to lead to the highest rate of gastric adverse effects, while ibuprofen (lower doses) and diclofenac appear to have lower rates. Certain NSAIDs, such as aspirin, have been marketed in enteric-coated formulations that manufacturers claim reduce the incidence of gastrointestinal ADRs. Similarly, some believe that rectal formulations may reduce gastrointestinal ADRs. However, consistent with the systemic mechanism of such ADRs, and in clinical practice, these formulations have not demonstrated a reduced risk of GI ulceration. Numerous "gastro-protective" drugs have been developed with the goal of preventing gastrointestinal toxicity in people who need to take NSAIDS on a regular basis. Gastric adverse effects may be reduced by taking medications that suppress acid production such as proton pump inhibitors (e.g. : omeprazole and esomeprazole), or by treatment with a drug that mimics prostaglandin in order to restore the lining of the GI tract (e.g. : a prostaglandin analog misoprostol). Diarrhea is a common side effect of misoprostol, however, higher doses of misoprostol have been shown to reduce the risk of a person having a complication related to a gastic ulcer while taking NSAIDS. While these techniques may be effective, they are expensive for maintenance therapy. Hydrogen sulfide NSAID hybrids prevent the gastric ulceration/bleeding associated with taking the NSAIDs alone. Hydrogen sulphide is known to have a protective effect on the cardiovascular and gastrointestinal system. NSAIDs should be used with caution in individuals with inflammatory bowel disease (e.g., Crohn's disease or ulcerative colitis) due to their tendency to cause gastric bleeding and form ulceration in the gastric lining. Photosensitivity is a commonly overlooked adverse effect of many of the NSAIDs. The 2-arylpropionic acids are the most likely to produce photosensitivity reactions, but other NSAIDs have also been implicated including piroxicam, diclofenac and benzydamine. Benoxaprofen, since withdrawn due to its liver toxicity, was the most photoactive NSAID observed. The mechanism of photosensitivity, responsible for the high photoactivity of the 2-arylpropionic acids, is the ready decarboxylation of the carboxylic acid moiety. The specific absorbance characteristics of the different chromophoric 2-aryl substituents, affects the decarboxylation mechanism. NSAIDs are not recommended during pregnancy, particularly during the third trimester. While NSAIDs as a class are not direct teratogens, they may cause premature closure of the fetal ductus arteriosus and kidney ADRs in the fetus. Additionally, they are linked with premature birth and miscarriage. Aspirin, however, is used together with heparin in pregnant women with antiphospholipid antibodies. Additionally, indomethacin is used in pregnancy to treat polyhydramnios by reducing fetal urine production via inhibiting fetal kidney blood flow. In contrast, paracetamol (acetaminophen) is regarded as being safe and well-tolerated during pregnancy, but Leffers et al. released a study in 2010 indicating that there may be associated male infertility in the unborn. Doses should be taken as prescribed, due to risk of liver toxicity with overdoses. In France, the country's health agency contraindicates the use of NSAIDs, including aspirin, after the sixth month of pregnancy. A variety of allergic or allergic-like NSAID hypersensitivity reactions follow the ingestion of NSAIDs. These hypersensitivity reactions differ from the other adverse reactions listed here which are toxicity reactions, i.e. unwanted reactions that result from the pharmacological action of a drug, are dose-related, and can occur in any treated individual; hypersensitivity reactions are idiosyncratic reactions to a drug. Some NSAID hypersensitivity reactions are truly allergic in origin: 1) repetitive IgE-mediated urticarial skin eruptions, angioedema, and anaphylaxis following immediately to hours after ingesting one structural type of NSAID but not after ingesting structurally unrelated NSAIDs; and 2) Comparatively mild to moderately severe T cell-mediated delayed onset (usually more than 24 hour), skin reactions such as maculopapular rash, fixed drug eruptions, photosensitivity reactions, delayed urticaria, and contact dermatitis; or 3) far more severe and potentially life-threatening t-cell-mediated delayed systemic reactions such as the DRESS syndrome, acute generalized exanthematous pustulosis, the Stevens–Johnson syndrome, and toxic epidermal necrolysis. Other NSAID hypersensitivity reactions are allergy-like symptoms but do not involve true allergic mechanisms; rather, they appear due to the ability of NSAIDs to alter the metabolism of arachidonic acid in favor of forming metabolites that promote allergic symptoms. Afflicted individuals may be abnormally sensitive to these provocative metabolites or overproduce them and typically are susceptible to a wide range of structurally dissimilar NSAIDs, particularly those that inhibit COX1. Symptoms, which develop immediately to hours after ingesting any of various NSAIDs that inhibit COX-1, are: 1) exacerbations of asthmatic and rhinitis (see aspirin-induced asthma) symptoms in individuals with a history of asthma or rhinitis and 2) exacerbation or first-time development of wheals or angioedema in individuals with or without a history of chronic urticarial lesions or angioedema. The use of NSAIDS for analgesia following gastrointestinal surgery remains controversial, given mixed evidence of an increased risk of leakage from any bowel anastomosis created. This risk may vary according to the class of NSAID prescribed. Common adverse drug reactions (ADR), other than listed above, include: raised liver enzymes, headache, dizziness. Uncommon ADRs include an abnormally high level of potassium in the blood, confusion, spasm of the airways, and rash. Ibuprofen may also rarely cause irritable bowel syndrome symptoms. NSAIDs are also implicated in some cases of Stevens–Johnson syndrome. Most NSAIDs penetrate poorly into the central nervous system (CNS). However, the COX enzymes are expressed constitutively in some areas of the CNS, meaning that even limited penetration may cause adverse effects such as somnolence and dizziness. In very rare cases, ibuprofen can cause aseptic meningitis. As with other drugs, allergies to NSAIDs might exist. While many allergies are specific to one NSAID, up to 1 in 5 people may have unpredictable cross-reactive allergic responses to other NSAIDs as well. NSAIDs reduce kidney blood flow and thereby decrease the efficacy of diuretics, and inhibit the elimination of lithium and methotrexate. NSAIDs cause decreased ability to form a blood clot, which can increase the risk of bleeding when combined with other drugs that also decrease blood clotting, such as warfarin. NSAIDs may aggravate hypertension (high blood pressure) and thereby antagonize the effect of antihypertensives, such as ACE inhibitors. NSAIDs may interfere and reduce efficiency of SSRI antidepressants. Various widely used nonsteroidal anti-inflammatory drugs (NSAIDs) enhance endocannabinoid signaling by blocking the anandamide-degrading membrane enzyme fatty acid amide hydrolase (FAAH). Most NSAIDs act as nonselective inhibitors of the enzyme cyclooxygenase (COX), inhibiting both the cyclooxygenase-1 (COX-1) and cyclooxygenase-2 (COX-2) isoenzymes. This inhibition is competitively reversible (albeit at varying degrees of reversibility), as opposed to the mechanism of aspirin, which is irreversible inhibition. COX catalyzes the formation of prostaglandins and thromboxane from arachidonic acid (itself derived from the cellular phospholipid bilayer by phospholipase A2). Prostaglandins act (among other things) as messenger molecules in the process of inflammation. This mechanism of action was elucidated by John Vane (1927–2004), who received a Nobel Prize for his work (see Mechanism of action of aspirin). COX-1 is a constitutively expressed enzyme with a "house-keeping" role in regulating many normal physiological processes. One of these is in the stomach lining, where prostaglandins serve a protective role, preventing the stomach mucosa from being eroded by its own acid. COX-2 is an enzyme facultatively expressed in inflammation, and it is inhibition of COX-2 that produces the desirable effects of NSAIDs. When nonselective COX-1/COX-2 inhibitors (such as aspirin, ibuprofen, and naproxen) lower stomach prostaglandin levels, ulcers of the stomach or duodenum internal bleeding can result. NSAIDs have been studied in various assays to understand how they affect each of these enzymes. While the assays reveal differences, unfortunately, different assays provide differing ratios. The discovery of COX-2 led to research to the development of selective COX-2 inhibiting drugs that do not cause gastric problems characteristic of older NSAIDs. Paracetamol (acetaminophen) is not considered an NSAID because it has little anti-inflammatory activity. It treats pain mainly by blocking COX-2 mostly in the central nervous system, but not much in the rest of the body. However, many aspects of the mechanism of action of NSAIDs remain unexplained, and for this reason, further COX pathways are hypothesized. The COX-3 pathway was believed to fill some of this gap but recent findings make it appear unlikely that it plays any significant role in humans and alternative explanation models are proposed. NSAIDs interact with the endocannabinoid system and its endocannabinoids, as COX2 have been shown to utilize endocannabinoids as substrates, and may have a key role in both the therapeutic and adverse effects of NSAIDs, as well as in NSAIDs-induced placebo responses. NSAIDs are also used in the acute pain caused by gout because they inhibit urate crystal phagocytosis besides inhibition of prostaglandin synthase. NSAIDS have antipyretic activity and can be used to treat fever. Fever is caused by elevated levels of prostaglandin E2, which alters the firing rate of neurons within the hypothalamus that control thermoregulation. Antipyretics work by inhibiting the enzyme COX, which causes the general inhibition of prostanoid biosynthesis (PGE2) within the hypothalamus. PGE2 signals to the hypothalamus to increase the body's thermal set point. Ibuprofen has been shown more effective as an antipyretic than paracetamol (acetaminophen).Arachidonic acid is the precursor substrate for cyclooxygenase leading to the production of prostaglandins F, D & E.
NSAIDs can be classified based on their chemical structure or mechanism of action. Older NSAIDs were known long before their mechanism of action was elucidated and were for this reason classified by chemical structure or origin. Newer substances are more often classified by mechanism of action. Most NSAIDs are chiral molecules (diclofenac is a notable exception). However, the majority are prepared in a racemic mixture. Typically, only a single enantiomer is pharmacologically active. For some drugs (typically profens), an isomerase enzyme in vivo converts the inactive enantiomer into the active form, although its activity varies widely in individuals. This phenomenon is likely responsible for the poor correlation between NSAID efficacy and plasma concentration observed in older studies, when specific analysis of the active enantiomer was not performed. Ibuprofen and ketoprofen are now available in single, active enantiomer preparations (dexibuprofen and dexketoprofen), which purport to offer quicker onset and an improved side-effect profile. Naproxen has always been marketed as the single active enantiomer. NSAIDs within a group tend to have similar characteristics and tolerability. There is little difference in clinical efficacy among the NSAIDs when used at equivalent doses. Rather, differences among compounds usually relate to dosing regimens (related to the compound's elimination half-life), route of administration, and tolerability profile. Regarding adverse effects, selective COX-2 inhibitors have lower risk of gastrointestinal bleeding, and there is no significant increase in risk of myocardial infarction. With the exception of naproxen, nonselective NSAIDs increase the risk of having a heart attack. Some data also supports that the partially selective nabumetone is less likely to cause gastrointestinal events. A consumer report noted that ibuprofen, naproxen, and salsalate are less expensive than other NSAIDs, and essentially as effective and safe when used appropriately to treat osteoarthritis and pain. Most nonsteroidal anti-inflammatory drugs are weak acids, with a pKa of 3–5. They are absorbed well from the stomach and intestinal mucosa. They are highly protein-bound in plasma (typically >95%), usually to albumin, so that their volume of distribution typically approximates to plasma volume. Most NSAIDs are metabolized in the liver by oxidation and conjugation to inactive metabolites that typically are excreted in the urine, though some drugs are partially excreted in bile. Metabolism may be abnormal in certain disease states, and accumulation may occur even with normal dosage. Ibuprofen and diclofenac have short half-lives (2–3 hours). Some NSAIDs (typically oxicams) have very long half-lives (e.g. 20–60 hours). From the era of Greek medicine to the mid-19th century, the discovery of medicinal agents was classed as an empirical art; folklore and mythological guidance were combined in deploying the vegetable and mineral products that made up the expansive pharmacopeia of the time. Myrtle leaves were in use by 1500 BCE. Hippocrates (460–377 BCE) first reported using willow bark and in 30 BCE Celsus described the signs of inflammation and also used willow bark to mitigate them. On 25 April 1763, Edward Stone wrote to the Royal Society describing his observations on the use of willow bark-based medicines in febrile patients. The active ingredient of willow bark, a glycoside called salicin, was first isolated by Johann Andreas Buchner in 1827. By 1829, French chemist Henri Leroux had improved the extraction process to obtain about 30g of purified salicin from 1.5 kg of bark. By hydrolysis, salicin releases glucose and salicylic alcohol which can be converted into salicylic acid, both in vivo and through chemical methods. The acid is more effective than salicin and, in addition to its fever-reducing properties, is anti-inflammatory and analgesic. In 1869, Hermann Kolbe synthesised salicylate, although it was too acidic for the gastric mucosa. The reaction used to synthesise aromatic acid from a phenol in the presence of CO2 is known as the Kolbe-Schmitt reaction. 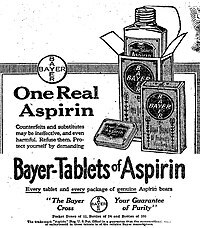 By 1897 the German chemist Felix Hoffmann and the Bayer company prompted a new age of pharmacology by converting salicylic acid into acetylsalicylic acid—named aspirin by Heinrich Dreser. 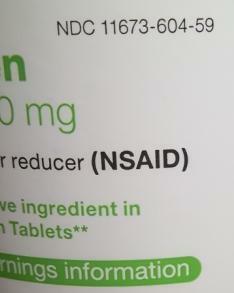 Other NSAIDs were developed from the 1950s forward. In 2001, NSAIDs accounted for 70,000,000 prescriptions and 30 billion over-the-counter doses sold annually in the United States. While studies have been conducted to see if various NSAIDs can improve behavior in transgenic mouse models of Alzheimer's disease and observational studies in humans have shown promise, there is no good evidence from randomized clinical trials that NSAIDs can treat or prevent Alzheimer's in humans; clinical trials of NSAIDs for treatment of Alzheimer's have found more harm than benefit. NSAIDs coordinate with metal ions affecting cellular function. Research supports the use of NSAIDs for the control of pain associated with veterinary procedures such as dehorning and castration of calves. The best effect is obtained by combining a short-term local anesthetic such as lidocaine with an NSAID acting as a longer term analgesic. However, as different species have varying reactions to different medications in the NSAID family, little of the existing research data can be extrapolated to animal species other than those specifically studied, and the relevant government agency in one area sometimes prohibits uses approved in other jurisdictions. For example, ketoprofen's effects have been studied in horses more than in ruminants but, due to controversy over its use in racehorses, veterinarians who treat livestock in the United States more commonly prescribe flunixin meglumine, which, while labeled for use in such animals, is not indicated for post-operative pain. In the United States, meloxicam is approved for use only in canines, whereas (due to concerns about liver damage) it carries warnings against its use in cats except for one-time use during surgery. In spite of these warnings, meloxicam is frequently prescribed "off-label" for non-canine animals including cats and livestock species. In other countries, for example The European Union (EU), there is a label claim for use in cats. ^ Bally, M; Dendukuri, N; Rich, B; Nadeau, L; Helin-Salmivaara, A; Garbe, E; Brophy, JM (9 May 2017). "Risk of acute myocardial infarction with NSAIDs in real world use: bayesian meta-analysis of individual patient data". BMJ (Clinical Research Ed.). 357: j1909. doi:10.1136/bmj.j1909. PMC 5423546. PMID 28487435. ^ Lanas, A; Chan, FK (23 February 2017). "Peptic ulcer disease". Lancet. 390 (10094): 613–624. doi:10.1016/S0140-6736(16)32404-7. PMID 28242110. ^ Buer JK (October 2014). "Origins and impact of the term 'NSAID'". Inflammopharmacology. 22 (5): 263–7. doi:10.1007/s10787-014-0211-2. hdl:10852/45403. PMID 25064056. ^ a b c d Day, Richard O.; Graham, Garry G. (2004). "The Vascular Effects of COX-2 selective inhibitors". Australian Prescriber. 27 (6): 142–145. doi:10.18773/austprescr.2004.119. ^ Brater, D. C.; Harris, C.; Redfern, J. S.; Gertz, B. J. (January 2001). "Renal effects of COX-2-selective inhibitors". American Journal of Nephrology. 21 (1): 1–15. doi:10.1159/000046212. ISSN 0250-8095. PMID 11275626. ^ Bleumink, Gysèle S.; Feenstra, Johannes; Sturkenboom, Miriam C. J. M.; Stricker, Bruno H. Ch (2003). "Nonsteroidal anti-inflammatory drugs and heart failure". Drugs. 63 (6): 525–534. doi:10.2165/00003495-200363060-00001. ISSN 0012-6667. PMID 12656651. ^ Warden SJ (April 2010). "Prophylactic Use of NSAIDs by Athletes: A Risk/Benefit Assessment". The Physician and Sportsmedicine. 38 (1): 132–138. doi:10.3810/psm.2010.04.1770. PMID 20424410. ^ Hinz B, Cheremina O, Brune K (2008). "Acetaminophen (paracetamol) is a selective cyclooxygenase-2 inhibitor in man". The FASEB Journal. 22 (2): 383–390. doi:10.1096/fj.07-8506com. PMID 17884974. ^ Machado, Gustavo C.; Maher, Chris G.; Ferreira, Paulo H.; Day, Richard O.; Pinheiro, Marina B.; Ferreira, Manuela L. (2 February 2017). "Non-steroidal anti-inflammatory drugs for spinal pain: a systematic review and meta-analysis". Annals of the Rheumatic Diseases. 76 (7): annrheumdis–2016–210597. doi:10.1136/annrheumdis-2016-210597. ISSN 1468-2060. PMID 28153830. ^ Towheed TE, Maxwell L, Judd MG, Catton M, Hochberg MC, Wells G (2006). "Acetaminophen for osteoarthritis". Cochrane Database Syst Rev (1): CD004257. doi:10.1002/14651858.CD004257.pub2. PMID 16437479. ^ Derry, Sheena; Conaghan, Philip; Da Silva, José António P.; Wiffen, Philip J.; Moore, R. Andrew (22 April 2016). "Topical NSAIDs for chronic musculoskeletal pain in adults" (PDF). The Cochrane Database of Systematic Reviews. 4: CD007400. doi:10.1002/14651858.CD007400.pub3. ISSN 1469-493X. PMID 27103611. ^ Gøtzsche PC (March 1989). "Methodology and overt and hidden bias in reports of 196 double-blind trials of nonsteroidal antiinflammatory drugs in rheumatoid arthritis". Controlled Clinical Trials. 10 (1): 31–56. doi:10.1016/0197-2456(89)90017-2. ISSN 0197-2456. PMID 2702836. ^ Lim, Blanche X.; Lim, Chris Hl; Lim, Dawn K.; Evans, Jennifer R.; Bunce, Catey; Wormald, Richard (2016). "Prophylactic non-steroidal anti-inflammatory drugs for the prevention of macular oedema after cataract surgery" (PDF). The Cochrane Database of Systematic Reviews. 11: CD006683. doi:10.1002/14651858.CD006683.pub3. ISSN 1469-493X. PMID 27801522. ^ Mallinson, Tom (2017). "A review of ketorolac as a prehospital analgesic". Journal of Paramedic Practice. 9 (12): 522–526. doi:10.12968/jpar.2017.9.12.522. Retrieved 2 June 2018. ^ "SDCEP Guidance on prescribing in Dentistry" (PDF). ^ Moore, R. Andrew; Derry, Sheena; Aldington, Dominic; Wiffen, Philip J. (28 September 2015). "Single dose oral analgesics for acute postoperative pain in adults - an overview of Cochrane reviews". The Cochrane Database of Systematic Reviews (9): CD008659. doi:10.1002/14651858.CD008659.pub3. ISSN 1469-493X. PMID 26414123. ^ Ashley, Paul F.; Parekh, Susan; Moles, David R.; Anand, Prabhleen; MacDonald, Laura C. I. (8 August 2016). "Preoperative analgesics for additional pain relief in children and adolescents having dental treatment". The Cochrane Database of Systematic Reviews (8): CD008392. doi:10.1002/14651858.CD008392.pub3. ISSN 1469-493X. PMID 27501304. ^ a b Eccleston, Christopher; Cooper, Tess E.; Fisher, Emma; Anderson, Brian; Wilkinson, Nick Mr (2017). "Non-steroidal anti-inflammatory drugs (NSAIDs) for chronic non-cancer pain in children and adolescents". The Cochrane Database of Systematic Reviews. 8: CD012537. doi:10.1002/14651858.CD012537.pub2. ISSN 1469-493X. PMID 28770976. ^ a b Cooper, Tess E.; Heathcote, Lauren C.; Anderson, Brian; Grégoire, Marie-Claude; Ljungman, Gustaf; Eccleston, Christopher (2017). "Non-steroidal anti-inflammatory drugs (NSAIDs) for cancer-related pain in children and adolescents". The Cochrane Database of Systematic Reviews. 7: CD012563. doi:10.1002/14651858.CD012563.pub2. ISSN 1469-493X. PMID 28737843. ^ Danelich, IM; Wright, SS; Lose, JM; Tefft, BJ; Cicci, JD; Reed, BN (May 2015). "Safety of nonsteroidal antiinflammatory drugs in patients with cardiovascular disease". Pharmacotherapy. 35 (5): 520–35. doi:10.1002/phar.1584. PMID 25940579. ^ Wilson JA, Romagnuolo J, Byrne TK, Morgan K, Wilson FA (2006). "Predictors of endoscopic findings after Roux-en-Y gastric bypass". Am J Gastroenterol. 101 (10): 2194–2199. doi:10.1111/j.1572-0241.2006.00770.x. PMID 17032183. ^ "Long Term Medical Issues associated after Roux-en-Y Gastric Bypass Procedure (RYGBP)" (PDF). SSMHealth. ^ a b c d e f Rostom A, Dube C, Wells G, Tugwell P, Welch V, Jolicoeur E, McGowan J (2002). "Prevention of NSAID-induced gastroduodenal ulcers". Cochrane Database Syst Rev (4): CD002296. doi:10.1002/14651858.CD002296. PMID 12519573. ^ Services, Department of Health & Human. "Medications - non-steroidal anti-inflammatory drugs". Retrieved 2 February 2018. ^ Lee A, Cooper MG, Craig JC, Knight JF, Keneally JP (2007). "Effects of nonsteroidal anti-inflammatory drugs on postoperative renal function in adults with normal renal function". Cochrane Database Syst Rev (2): CD002765. doi:10.1002/14651858.CD002765.pub3. PMID 17443518. ^ a b StarSurg Collaborative (2017). "Safety of Nonsteroidal Anti-inflammatory Drugs in Major Gastrointestinal Surgery: A Prospective, Multicenter Cohort Study". World Journal of Surgery. 41 (1): 47–55. doi:10.1007/s00268-016-3727-3. PMID 27766396. ^ a b StarSurg Collaborative (2014). "Impact of postoperative non-steroidal anti-inflammatory drugs on adverse events after gastrointestinal surgery". BJS. 101 (11): 1413–23. doi:10.1002/bjs.9614. PMID 25091299. ^ a b Bhangu A, Singh P, Fitzgerald JE, Slesser A, Tekkis P (2014). "Postoperative nonsteroidal anti-inflammatory drugs and risk of anastomotic leak: meta-analysis of clinical and experimental studies". World Journal of Surgery. 38 (9): 2247–57. doi:10.1007/s00268-014-2531-1. PMID 24682313. ^ a b Green GA (2001). "Understanding NSAIDs: from aspirin to COX-2". Clinical Cornerstone. 3 (5): 50–60. doi:10.1016/S1098-3597(01)90069-9. ISSN 1098-3597. PMID 11464731. ^ Bayer HealthCare Pharmaceuticals Inc (September 2008). "CIPRO (ciprofloxacin hydrochloride) TABLETS CIPRO,(ciprofloxacin*) ORAL SUSPENSION" (PDF). USA: FDA. Retrieved 31 August 2009. ^ Royal Pharmaceutical Society of Great Britain (2009). "5 Infections". British National Formulary (BNF 57). BMJ Group and RPS Publishing. ISBN 978-0-85369-845-6. ^ van Walsem A, Pandhi S, Nixon RM, Guyot P, Karabis A, Moore RA (2015). "Relative benefit-risk comparing diclofenac to other traditional non-steroidal anti-inflammatory drugs and cyclooxygenase-2 inhibitors in patients with osteoarthritis or rheumatoid arthritis: a network meta-analysis". Arthritis Research & Therapy. 17 (1): 66. doi:10.1186/s13075-015-0554-0. PMC 4411793. PMID 25879879. ^ Bombardier C, Laine L, Reicin A, Shapiro D, Burgos-Vargas R, Davis B, Day R, Ferraz MB, Hawkey CJ, Hochberg MC, Kvien TK, Schnitzer TJ (November 2000). "Comparison of upper gastrointestinal toxicity of rofecoxib and naproxen in patients with rheumatoid arthritis". New England Journal of Medicine. 343 (21): 1520–8, 2 p following 1528. doi:10.1056/NEJM200011233432103. ISSN 0028-4793. PMID 11087881. ^ Baron JA, Sandler RS, Bresalier RS, Lanas A, Morton DG, Riddell R, Iverson ER, Demets DL (15 November 2008). "Cardiovascular events associated with rofecoxib: final analysis of the APPROVe trial". Lancet. 372 (9651): 1756–64. doi:10.1016/S0140-6736(08)61490-7. PMID 18922570. ^ Colebatch, AN (2011). "Safety of non-steroidal anti-inflammatory drugs, including aspirin and paracetamol (acetaminophen) in people receiving methotrexate for inflammatory arthritis (rheumatoid arthritis, ankylosing spondylitis, psoriatic arthritis, other spondyloarthritis)". Cochrane Database of Systematic Reviews (11): CD008872. doi:10.1002/14651858.CD008872.pub2. PMID 22071858. ^ Kearney PM, Baigent C, Godwin J, Halls H, Emberson JR, Patrono C (June 2006). "Do selective cyclo-oxygenase-2 inhibitors and traditional nonsteroidal anti-inflammatory drugs increase the risk of atherothrombosis? Meta-analysis of randomised trials" (Free full text). BMJ (Clinical Research Ed.). 332 (7553): 1302–8. doi:10.1136/bmj.332.7553.1302. ISSN 0959-8138. PMC 1473048. PMID 16740558. ^ a b Trelle S, Reichenbach S, Wandel S, Hildebrand P, Tschannen B, Villiger PM, Egger M, Jüni P (11 January 2011). "Cardiovascular safety of non-steroidal anti-inflammatory drugs: network meta-analysis". BMJ (Clinical Research Ed.). 342 (jan11 1): c7086. doi:10.1136/bmj.c7086. PMC 3019238. PMID 21224324. ^ Bally, Michèle; Dendukuri, Nandini; Rich, Benjamin; Nadeau, Lyne; Helin-Salmivaara, Arja; Garbe, Edeltraut; Brophy, James M (9 May 2017). "Risk of acute myocardial infarction with NSAIDs in real world use: bayesian meta-analysis of individual patient data". BMJ. 357: j1909. doi:10.1136/bmj.j1909. PMC 5423546. PMID 28487435. ^ Schjerning Olsen AM, Fosbøl EL, Lindhardsen J, Folke F, Charlot M, Selmer C, Lamberts M, Bjerring Olesen J, Køber L, Hansen PR, Torp-Pedersen C, Gislason GH (9 May 2011). "Duration of Treatment With Nonsteroidal Anti-Inflammatory Drugs and Impact on Risk of Death and Recurrent Myocardial Infarction in Patients With Prior Myocardial Infarction: A Nationwide Cohort Study". Circulation. 123 (20): 2226–35. doi:10.1161/CIRCULATIONAHA.110.004671. PMID 21555710. ^ a b Bhala N, Emberson J, Merhi A, Abramson S, Arber N, Baron JA, Bombardier C, Cannon C, Farkouh ME, FitzGerald GA, Goss P, Halls H, Hawk E, Hawkey C, Hennekens C, Hochberg M, Holland LE, Kearney PM, Laine L, Lanas A, Lance P, Laupacis A, Oates J, Patrono C, Schnitzer TJ, Solomon S, Tugwell P, Wilson K, Wittes J, Baigent C (31 August 2013). "Vascular and upper gastrointestinal effects of non-steroidal anti-inflammatory drugs: meta-analyses of individual participant data from randomised trials". Lancet. 382 (9894): 769–79. doi:10.1016/S0140-6736(13)60900-9. PMC 3778977. PMID 23726390. ^ Page J, Henry D (March 2000). "Consumption of NSAIDs and the development of congestive heart failure in elderly patients: an underrecognized public health problem" (Free full text). Archives of Internal Medicine. 160 (6): 777–84. doi:10.1001/archinte.160.6.777. ISSN 0003-9926. PMID 10737277. ^ Gislason GH, Rasmussen JN, Abildstrom SZ, Schramm TK, Hansen ML, Fosbøl EL, Sørensen R, Folke F, Buch P, Gadsbøll N, Rasmussen S, Poulsen HE, Køber L, Madsen M, Torp-Pedersen C (2009). "Increased Mortality and Cardiovascular Morbidity Associated with Use of Nonsteroidal Anti-inflammatory Drugs in Chronic Heart Failure". Archives of Internal Medicine. 169 (2): 141–149. doi:10.1001/archinternmed.2008.525. PMID 19171810. ^ Staff (9 July 2015). "FDA Strengthens Warning of Heart Attack and Stroke Risk for Non-Steroidal Anti-Inflammatory Drugs". FDA. Retrieved 9 July 2015. ^ Shiri R, Koskimäki J, Häkkinen J, Tammela TL, Auvinen A, Hakama M (May 2006). "Effect of Nonsteroidal Anti-Inflammatory Drug Use on the Incidence of Erectile Dysfunction". Journal of Urology. 175 (5): 1812–1816. doi:10.1016/S0022-5347(05)01000-1. PMID 16600768. ^ Gleason JM, Slezak JM, Jung H, Reynolds K, Van den Eeden SK, Haque R, Quinn VP, Loo RK, Jacobsen SJ (2011). "Regular Nonsteroidal Anti-Inflammatory Drug Use and Erectile Dysfunction". The Journal of Urology. 185 (4): 1388–1393. doi:10.1016/j.juro.2010.11.092. PMID 21334642. Retrieved 21 July 2014. ^ Barclay, Laurie (8 March 2011). "Regular NSAID Use Linked to Erectile Dysfunction". Medscape. Retrieved 21 July 2014. ^ Neale, Todd (5 March 2011). "NSAID Use Tied to Men's Sexual Performance". MedPage Today. Retrieved 21 July 2014. ^ Traversa G, Walker AM, Ippolito FM, Caffari B, Capurso L, Dezi A, Koch M, Maggini M, Alegiani SS, Raschetti R (January 1995). "Gastroduodenal toxicity of different nonsteroidal antiinflammatory drugs". Epidemiology. 6 (1): 49–54. doi:10.1097/00001648-199501000-00010. ISSN 1044-3983. PMID 7888445. ^ Higuchi K, Umegaki E, Watanabe T, Yoda Y, Morita E, Murano M, Tokioka S, Arakawa T (July 2009). "Present status and strategy of NSAIDs-induced small bowel injury". Journal of Gastroenterology. 44 (9): 879–888. doi:10.1007/s00535-009-0102-2. ISSN 1435-5922. PMID 19568687. ^ Guo, Wei; Cheng, Ze-yu; Zhu, Yi-zhun (October 2013). "Hydrogen sulfide and translational medicine". Acta Pharmacologica Sinica. 34 (10): 1284–1291. doi:10.1038/aps.2013.127. ISSN 1671-4083. PMC 3791558. PMID 24096643. ^ Thomas MC (February 2000). "Diuretics, ACE inhibitors and NSAIDs—the triple whammy". The Medical Journal of Australia. 172 (4): 184–5. ISSN 0025-729X. PMID 10772593. ^ De Broe ME, Elseviers MM (February 1998). "Analgesic nephropathy". New England Journal of Medicine. 338 (7): 446–52. doi:10.1056/NEJM199802123380707. ISSN 0028-4793. PMID 9459649. ^ Moore DE (2002). "Drug-induced cutaneous photosensitivity: incidence, mechanism, prevention and management". Drug Safety. 25 (5): 345–72. doi:10.2165/00002018-200225050-00004. ISSN 0114-5916. PMID 12020173. ^ Østensen ME, Skomsvoll JF (March 2004). "Anti-inflammatory pharmacotherapy during pregnancy". Expert Opinion on Pharmacotherapy. 5 (3): 571–80. doi:10.1517/14656566.5.3.571. ISSN 1465-6566. PMID 15013926. ^ Nakhai-Pour HR, Broy P, Sheehy O, Bérard A (September 2011). "Use of nonaspirin nonsteroidal anti-inflammatory drugs during pregnancy and the risk of spontaneous abortion". Canadian Medical Association Journal. 183 (15): 1713–20. doi:10.1503/cmaj.110454. PMC 3193112. PMID 21896698. ^ Reza Nakhai-Pour, Hamid (2011). "Use of nonaspirin nonsteroidal anti-inflammatory drugs during pregnancy and the risk of spontaneous abortion". Canadian Medical Association Journal. 183 (15): 1713–1720. doi:10.1503/cmaj.110454. PMC 3193112. PMID 21896698. ^ Cervera R, Balasch J (2004). "The management of pregnant patients with antiphospholipid syndrome". Lupus. 13 (9): 683–7. doi:10.1191/0961203304lu1092oa. ISSN 0961-2033. PMID 15485103. ^ Graham GG, Scott KF, Day RO (2005). "Tolerability of paracetamol". Drug Safety. 28 (3): 227–40. doi:10.2165/00002018-200528030-00004. ISSN 0114-5916. PMID 15733027. ^ Kristensen DM, Hass U, Lesné L, Lottrup G, Jacobsen PR, Desdoits-Lethimonier C, Boberg J, Petersen JH, Toppari J, Jensen TK, Brunak S, Skakkebaek NE, Nellemann C, Main KM, Jégou B, Leffers H (2011). "Intrauterine exposure to mild analgesics is a risk factor for development of male reproductive disorders in human and rat". Hum. Reprod. 26 (1): 235–44. doi:10.1093/humrep/deq323. PMID 21059752. ^ Wilkes JM, Clark LE, Herrera JL (November 2005). "Acetaminophen overdose in pregnancy". Southern Medical Journal. 98 (11): 1118–22. doi:10.1097/01.smj.0000184792.15407.51. ISSN 0038-4348. PMID 16351032. ^ Dreillard, Audrey (2 March 2009). "Grossesse – Mamans attention". France Soir (in French). Retrieved 1 June 2009. ^ Kowalski ML, Makowska JS (2015). "Seven steps to the diagnosis of NSAIDs hypersensitivity: how to apply a new classification in real practice?". Allergy Asthma Immunol Res. 7 (4): 312–320. doi:10.4168/aair.2015.7.4.312. PMC 4446629. PMID 25749768. ^ Auriel E, Regev K, Korczyn AD (2014). Nonsteroidal anti-inflammatory drugs exposure and the central nervous system. Handb Clin Neurol. Handbook of Clinical Neurology. 119. pp. 577–84. doi:10.1016/B978-0-7020-4086-3.00038-2. ISBN 9780702040863. PMID 24365321. ^ Woessner KM, Castells M (2013). "NSAID single-drug-induced reactions". Immunol Allergy Clin North Am. 33 (2): 237–49. doi:10.1016/j.iac.2012.12.002. PMID 23639711. ^ Shionoiri H (July 1993). "Pharmacokinetic drug interactions with ACE inhibitors". Clinical Pharmacokinetics. 25 (1): 20–58. doi:10.2165/00003088-199325010-00003. PMID 8354016. Retrieved 30 November 2012. ^ "Why Painkillers Interfere with Anti-depressants". healthcentral.com. ^ Warner-Schmidt JL, Vanover KE, Chen EY, Marshall JJ, Greengard P (2011). "Antidepressant effects of selective serotonin reuptake inhibitors (SSRIs) are attenuated by antiinflammatory drugs in mice and humans". Proc. Natl. Acad. Sci. U.S.A. 108 (22): 9262–7. Bibcode:2011PNAS..108.9262W. doi:10.1073/pnas.1104836108. PMC 3107316. PMID 21518864. ^ Bertolacci L, Romeo E, Veronesi M, Magotti P, Albani C, Dionisi M, Lambruschini C, Scarpelli R, Cavalli A, De Vivo M, Piomelli D, Garau G (January 2013). "A binding site for nonsteroidal anti-inflammatory drugs in fatty acid amide hydrolase". J Am Chem Soc. 135 (1): 22–25. doi:10.1021/ja308733u. PMC 3562592. PMID 23240907. ^ Knights, Kathleen. "Defining the COX Inhibitor Selectivity of NSAIDs: Implications for Understanding Toxicity". Web MD LLC. Retrieved 17 February 2013. ^ "INHIBIT ORS OF CYCLOOXYGENASES: MECHANISMS, SELECTIVITY AND USES" (PDF). Journal of Physiology and Pharmacology. Retrieved 16 March 2014. ^ a b Hinz B, Cheremina O, Brune K (2008). "Acetaminophen (paracetamol) is a selective cyclooxygenase-2 inhibitor in man". The FASEB Journal. 22 (2): 383–390. doi:10.1096/fj.07-8506com. PMID 17884974. ^ Fowler, C J (27 January 2017). "The contribution of cyclooxygenase-2 to endocannabinoid metabolism and action". British Journal of Pharmacology. 152 (5): 594–601. doi:10.1038/sj.bjp.0707379. ISSN 0007-1188. PMC 2190012. PMID 17618306. ^ Rouzer, Carol A.; Marnett, Lawrence J. (28 March 2008). "Non-redundant Functions of Cyclooxygenases: Oxygenation of Endocannabinoids". The Journal of Biological Chemistry. 283 (13): 8065–8069. doi:10.1074/jbc.R800005200. ISSN 0021-9258. PMC 2417164. PMID 18250160. ^ Hamza, May; Dionne, Raymond A. (1 January 2009). "Mechanisms of Non-Opioid Analgesics Beyond Cyclooxygenase Enzyme Inhibition". Current Molecular Pharmacology. 2 (1): 1–14. doi:10.2174/1874-470210902010001. ISSN 1874-4672. PMC 2749259. PMID 19779578. ^ Cronstein, BN; Sunkureddi, P (January 2013). "Mechanistic aspects of inflammation and clinical management of inflammation in acute gouty arthritis". Journal of Clinical Rheumatology. 19 (1): 19–29. doi:10.1097/RHU.0b013e31827d8790. PMC 3551244. PMID 23319019. ^ a b c Aronoff DM, Neilson EG (September 2001). "Antipyretics: mechanisms of action and clinical use in fever suppression". Am. J. Med. 111 (4): 304–15. doi:10.1016/S0002-9343(01)00834-8. PMID 11566461. ^ a b c Koeberle A, Werz O (2009). "Inhibitors of the microsomal prostaglandin E(2) synthase-1 as alternative to non steroidal anti-inflammatory drugs (NSAIDs)–a critical review". Curr. Med. Chem. 16 (32): 4274–96. doi:10.2174/092986709789578178. PMID 19754418. ^ a b Nabulsi M (2009). "Is combining or alternating antipyretic therapy more beneficial than monotherapy for febrile children?". BMJ. 339: b3540. doi:10.1136/bmj.b3540. PMID 19797346. ^ Coceani F, Bishai I, Lees J, Sirko S (1986). "Prostaglandin E2 and fever: a continuing debate". Yale J Biol Med. 59 (2): 169–74. PMC 2590134. PMID 3488620. ^ Rainsford KD (December 2009). "Ibuprofen: pharmacology, efficacy and safety". Inflammopharmacology. 17 (6): 275–342. doi:10.1007/s10787-009-0016-x. PMID 19949916. ^ "Information for Healthcare Professionals: Celecoxib (marketed as Celebrex)". Fda.gov. Retrieved 8 March 2017. ^ "Safety of Vioxx". FDA Public Health Advisory. United States Food and Drug Administration. Retrieved 8 March 2017. ^ "Information for Healthcare Professionals: Valdecoxib (marketed as Bextra)". Fda.gov. Retrieved 8 March 2017. ^ McNaughton, R; Huet, G; Shakir, S (15 January 2014). "An investigation into drug products withdrawn from the EU market between 2002 and 2011 for safety reasons and the evidence used to support the decision-making". BMJ Open. 4 (1): e004221. doi:10.1136/bmjopen-2013-004221. PMC 3902466. PMID 24435895. ^ Viljoen A, Mncwangi N, Vermaak I (2012). "Anti-inflammatory iridoids of botanical origin". Curr. Med. Chem. 19 (14): 2104–27. doi:10.2174/092986712800229005. PMC 3873812. PMID 22414102. ^ a b c Hardman, Joel G.; Limbird, Lee E.; Goodman Gilman, Alfred (1996). "Capítulo 27: Analgésicos-antipiréticos, antiinflamatorios y fármacos que se utilizan en el tratamiento de la gota.". Goodman & Gilman, las bases farmacológicas de la terapéutica (9 ed.). México, D. F.: Ed. McGraw-Hill Interamericana. ISBN 978-0-07-026266-9. ^ Hermann Kolbe (1860). "Ueber Synthese der Salicylsäure". Annalen der Chemie und Pharmacie. 113 (1): 125–27. doi:10.1002/jlac.18601130120. ^ R. Schmitt (1885). "Beitrag zur Kenntniss der Kolbe'schen Salicylsäure Synthese". Journal für Praktische Chemie. 31 (1): 397–411. doi:10.1002/prac.18850310130. ^ Miguel-Álvarez M; et al. (February 2015). "Non-steroidal anti-inflammatory drugs as a treatment for Alzheimer's disease: a systematic review and meta-analysis of treatment effect". Drugs Aging. 32 (2): 139–47. doi:10.1007/s40266-015-0239-z. PMID 25644018. ^ Jaturapatporn D; et al. (2012). "Aspirin, steroidal and non-steroidal anti-inflammatory drugs for the treatment of Alzheimer's disease". Cochrane Database Syst Rev (2): CD006378. doi:10.1002/14651858.CD006378.pub2. PMID 22336816. ^ Wang J; et al. (2015). "Anti-inflammatory drugs and risk of Alzheimer's disease: an updated systematic review and meta-analysis". J Alzheimers Dis. 44 (2): 385–96. doi:10.3233/JAD-141506. PMID 25227314. ^ Banti Christina N (2016). "Non-Steroidal Anti-Inflammatory Drugs (NSAIDs) in Metal Complexes and Their Effect at the Cellular Level". European Journal of Inorganic Chemistry. 2016 (19): 3048–3071. doi:10.1002/ejic.201501480. ^ "NADA 141–213: New Animal Drug Application Approval (for Metacam® (meloxicam) 0.5 mg/mL and 1.5 mg/mL Oral Suspension)" (PDF). US Food and Drug Administration. 15 April 2003. Retrieved 24 July 2010. ^ Metacam Client Information Sheet, product description: "Non-steroidal anti-inflammatory drug for oral use in dogs only", and in the "What Is Metacam" section in bold-face type: "Do not use in cats. ", January 2005. ^ Metacam 5 mg/mL Solution for Injection, Supplemental Approval 28 October 2004. ^ Off-label use discussed in: Arnold Plotnick MS, DVM, ACVIM, ABVP, Pain Management using Metacam Archived 14 July 2011 at the Wayback Machine, and Stein, Robert, Perioperative Pain Management Part IV, Looking Beyond Butorphanol, September 2006.